Here is a small series of senior photos from a shoot I did with Tanicia Jenkins from Parkview High School class of 2013. These were taken at the Japanese Scroll Garden in Springfield Missouri by Ben Nelson. Here are a few of the photos that we liked. Cute senior photo shot of Tanicia with black skirt and pink top with lace bow. Leaning against a tree with green grass and water in the background. 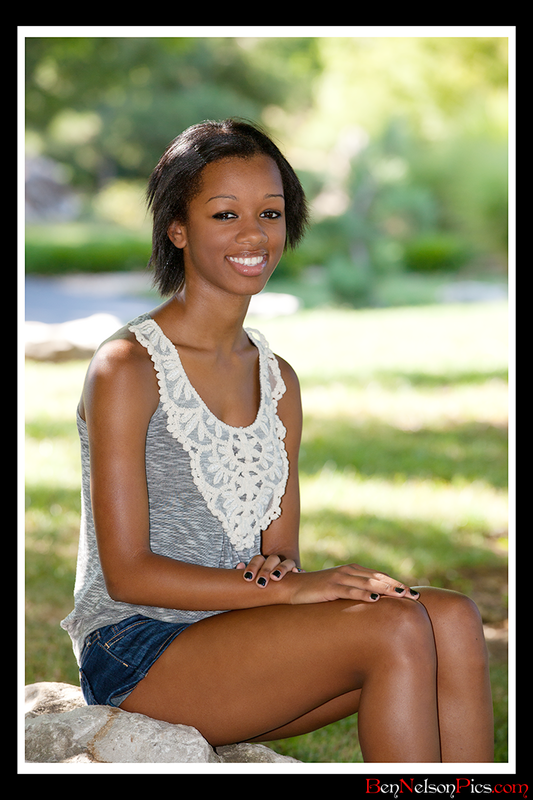 Outdoor senior picture of Tanicia with white shorts, orange top, high heeled platform shoes, in a nature setting. Senior Portraits of Tanicia laying down on a small bridge with blue jean shorts and a blue top, cute pose. Senior Picture with Tanicia wearing a black shirt and pink top, standing in the middle of some tall bamboo shoots. Tanicia is wearing a black shirt and blue jeans in this senior photo, she is laying facing the camera on a small walking bridge.